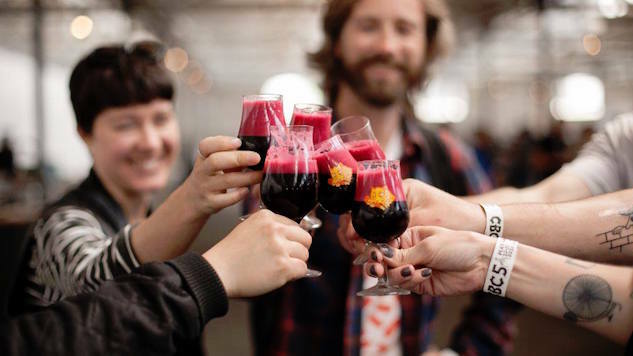 After several years of successful events in Denmark, Mikkeller brought the Copenhagen Beer Celebration (CBC) to the U.S. this past weekend. Brewers from around the globe, both small and large descended upon Boston’s City Plaza for a weekend of live music and, more importantly, beer. With a little help from the weather, CBC delivered a truly unique experience creating a melting pot of beer nerds, music lovers, and people who just wanted to have a good time. With three sessions, each ranging from four to five hours, lines were short (unless you’re Bokkereyder), kegs rarely kicked, and spirits were high. While there was no shortage of beer to try, we managed to pick a few favorites. With a festival as long as CBC, big stouts aren’t always the way to go, but we could not resist trying the big brother version of a favorite from Angry Chair. Very few dessert beers are able to actually deliver on their name, but Angry Chair did not disappoint with the beer that launched their dessert series. This decadent treat in a glass gives off a sweet chocolate brownie aroma, and endless amounts of chewy coconut on the mouthfeel. After trying this one, we can’t wait to try more of their offerings. As if a peanut butter biscuit stout wasn’t enough, these two breweries decided to take their creation to the next level, aging it in bourbon barrels and adding cocoa and vanilla. The original Yellow Belly is smooth, with a faint peanut butter taste on the mouthfeel and a little bitterness, however with these additions, we get a very different beer all together. The nose is an in-your-face vanilla and marshmallow swirl, with the peanut butter being much more pronounced. While the barrels do provide a little more sweetness to the beer, the peanut butter still gives a savory quality, rounding out another favorite from the weekend. If any brewery won the weekend, it was the ever-humble, one-man operation that is Bokkereyder. Three years since opening in 2013, Bokkereyder has a capacity of about 80 oak barrels, making “him” one of the smallest breweries pouring at CBC. Offering over 20 blends, Bokkereyder was one of the tents we had to try…we just didn’t expect everyone else to feel the same way. Having never poured in the U.S., Bokkereyder had quite the coming out party sporting the longest lines through all three sessions. While each beer of his was excellent, two truly stood out. Framboos Vanille is made with two-year old Lambic from pinot noir barrels, with 200 pounds of fresh raspberries and both Tahitian and Madagascar vanilla beans. The vanilla bean combo softens the acidity, and adds additional complexity to both the aroma and texture of this beautiful beer. With over 20 blends available during the course of three sessions, Pinot Kriek was the only Bokkereyder beer with a tapping time. At 9 p.m. on Saturday night, the line peaked to see if Pinot Kriek would live up to the expectations, and it certainly did. Made with one and two-year old Lambic from pinot noir barrels and about 40,000 Schaarbeekse cherries, all handpicked by the blender himself, this beer was worth the wait. The pinot barrels, which came from a local winery in Belgium, provide a soft and subtle touch to the beer, while the cherries provide a cherry-pie, almond crust mouth-feel. After hearing the rave reviews of a beautiful purple-colored sour poured at this past year’s Festival of Farmhouse Ales at Hill Farmstead, we knew this was going to be a must-try beer for the weekend. With a very assertive nose, and a consistency that made us feel like we were literally chewing raspberry seeds (they use four pounds of raspberries per liter), this tart and fruity non-traditional Lambic was one to remember from the festival’s creator. While many of you are familiar with Florida’s Cigar City, just two years into opening, The Answer Brewpub has become one of the hidden gems from Richmond, Virginia. For the pair’s third collaboration, they decided to take their stout Good Night Mekong and treat it with coconut and cinnamon. While the beer pours a cola color, with a very faint nose, it shines on the mouthfeel with an ongoing assault of coconut and cinnamon to the palate. Cellarmaker, known for their East and West Coast hoppy offerings, decided to switch things up on night one, bringing their imperial smoked porter. The beer pours a dark-brown coffee color with a nose of cocoa, roasted malts and coffee. Closing your eyes, you get the familiar smell of a morning in your favorite local coffee shop or diner. It has an intense coffee taste, with a faint-lingering smokiness on the back-end, making it enjoyable to even those that aren’t fans of smoked beers. As one of the top meaderies in the world, Superstition was bound to bring some of their finest liquids to CBC. One of our favorites was Rule 42, made with organic apple cider, Arizona Wildflower Honey, and blackberry juice. At 14% ABV, this mead is dangerously good, especially for a beer festival, and pours a rich syrupy dark purple. The mouthfeel provides a little tartness, a little bit of apple, followed by a lingering blackberry taste. The hometown brewery gave festival attendees a chance to try one of their best hoppy offerings, pouring Double Dry Hopped Fort Point in all three sessions. With short lines, we made sure to stop by and try one of our favorites a few times. The beer pours a hazy golden northeast IPA color, a characteristic of most of Trillium’s hoppy offerings. The mouthfeel is crisp, refreshing, lemon citrus, with a light malty backbone, and a little zest on the back-end, perfect for any occasion. We would be remiss not to include one of our favorites from Hill Farmstead on this list. Poured on day two, Arthur is a bright hazy yellow, with a thick white head. The nose gives off a smell of funk, lemon and grass, immediately transporting you to Greensboro, Vermont. The mouthfeel is tart, yet incredibly delicate finishing strong with citrus fruits. Truly a beer you should never pass up.